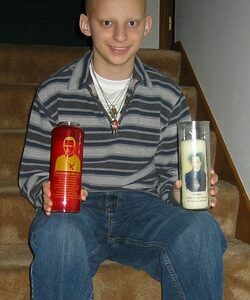 Is Joey Schwartz 2nd miracle for Blessed Seelos Canonization? WWL in New Orleans a new second miracle has been found.In it he mentions the miracle of Joey.We have an article which gives the full information of Joey and the cancer her recovered from. September 25, 2009 - 8:30am. It might sound like a plot line from a movie, but after his family visited a Catholic shrine in New Orleans, Joey Schwartz’s latest CT scan showed he’s cancer free just two months after being told terminal cancer had returned. 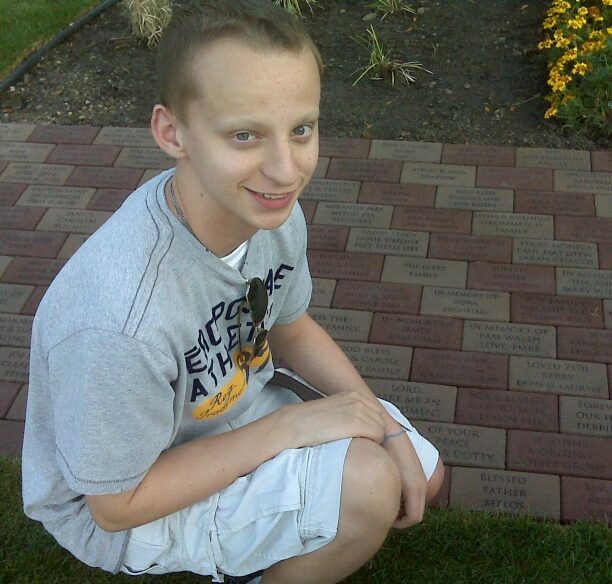 Joey was first diagnosed with a very rare form of cancer, midline carcinoma, in March 2008 when he was 13. After 10 months of highly-toxic chemotherapy followed by six weeks of radiation, he was told he was in remission. But, during a follow-up PET scan in July, the 14-year-old from Savage was told he had to continue his fight the aggressive cancer. “When Joey was re-diagnosed, the reoccurrence on the chest wall and in his lungs was devastating news,” Paul said. “The doctor told us, ‘I can’t offer hope at this point.’”Doctors identified two large masses on his chest wall and dozens of small tumors in his lungs. 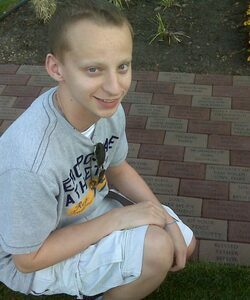 Deciding to fight anyway, Joey started chemotherapy again and with the support of his parents, Paul and Melinda, along with his twin brother Derek, the family turned to their Catholic faith. They had been following a story about a 71-year-old woman who had been diagnosed with terminal esophageal cancer that had spread throughout her body, but the malignant tumors disappeared after prayers to Blessed Father Seelos, who died in 1867 in New Orleans. Seelos has been beatified by the Vatican and is believed to have successful intercessions for ill people. 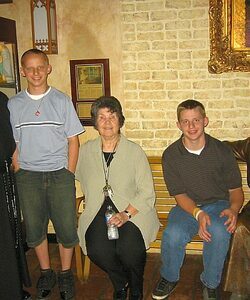 The woman, Mary Ellen Heibel, has been cancer free since 2005. 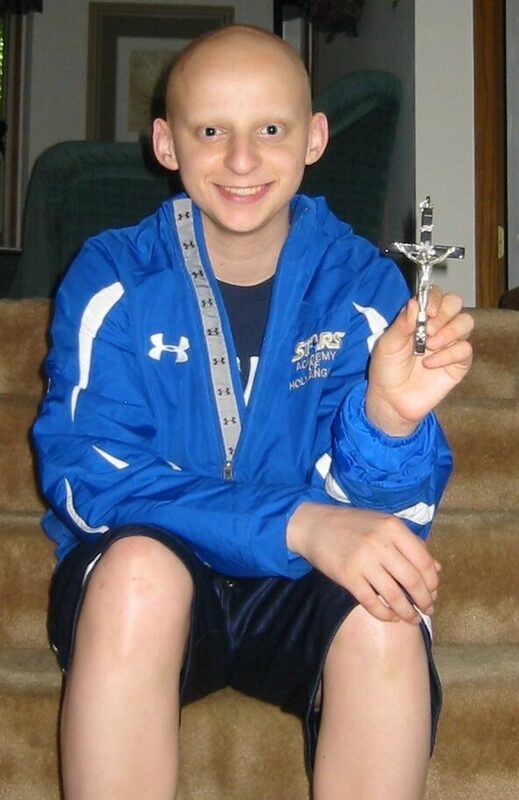 Paul ordered a first-class relic, a small piece Seelos’s body, for Joey to wear in a pendant as a point of focus for prayers, as Heibel has done. 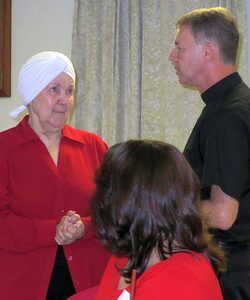 “Obviously not everyone who prays to Seelos is healed,” Paul said. But, he added, prayers couldn’t do any harm. After one round of the toxic drugs and getting an affirmative nod from their doctor, the Schwartz family made a pilgrimage to New Orleans to visit a shrine to Seelos. “It may have been New Orleans, but it wasn’t voodoo,” Melinda said with a laugh. The family attended a Sunday mass and a woman in charge of the administration of the Seelos shrine, Joyce Bourgeois, took special care of the family. 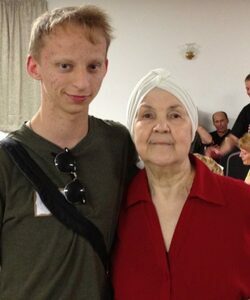 “Just talking to her on the phone is a spiritual experience,” Melinda said. 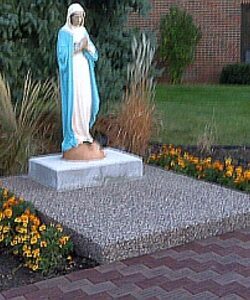 Joey said throughout the mass Bourgeois had her hands on his shoulders to bless him. 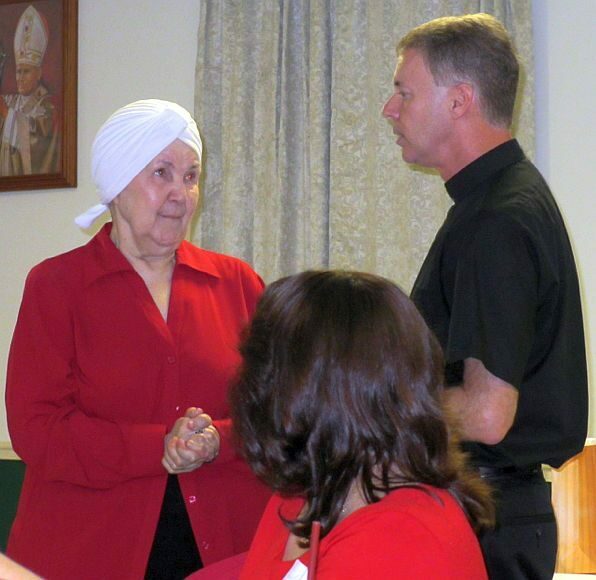 Along with Bourgeois and other shrine officials, Paul said many parishioners offered up their anecdotal stories about the intercessions Seelos had done for them and expressed hope for Joey. With Joey still wearing the relic, the Schwartz family headed home. After one more round of chemo and one CT scan on Sept. 3, the family thought their prayers were answered. “We were hoping the scans would show the tumors had either stayed the same size or shrunken a little,” Paul said of their feelings going into the appointment. When Dr. Jawhar Rawwas, Joey’s oncology doctor at Children’s Hospital, read the scans initially, he told the family the tumors had shrunk. After bringing Joey back to the Academy of Holy Angels where he and Derek are freshman, Paul and Melinda got a call from the doctor. Immediately, they turned to their faith. 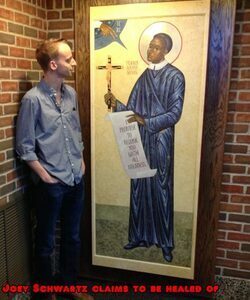 “Instinctively we were making the sign of the cross,” Paul recalled. “I already knew that,” Joey said. Back at the high school, Derek received the good news first. “I almost dropped my football helmet,” he said. As for Joey – “he kept stepping back away from us and saying ‘you’re kidding, you’re kidding.’” Melinda recalled. While they all place a lot of faith in the miracle, Joey will continue with the rounds of chemo, as planned. “Right now they don’t know that God didn’t heal me through the work of the chemo,” Joey said. “We’re not getting the sense that it’s something we should stop,” Paul added. Joey’s hopeful the original plan of nine months of chemo will be abbreviated soon. For as large of a role as each family member’s faith has played in Joey’s journey, their familial steadfast devotion is fairly new. Paul, who said he had been largely atheist and agnostic since he was 15, came back to his childhood faith when Joey was first diagnosed with midline carcinoma in 2008. Melinda, who grew up in a Baptist church and converted to Catholicism when she was a teenager, said she wasn’t totally sold on the religion, but now feels strongly connected. “I’ve been a Christian since I was 15 and my faith has never been as powerful as it is now,” she said. Even after Joey’s short-lived remission and it looked like his cancer was back, they stayed faithful. “We stayed strong spiritually throughout everything,” Joey said. Now there are daily prayers as a family, something they’d never done before. Joey’s faith is one he wears not on his sleeve, but around his neck. Along with the Seelos relic there are other chains with medals and pendants of the Blessed Virgin Mary, St. Peregrine –the patron saint of cancer and a cross that he wears every day. Keighla Schmidt can be reached at kschmidt@swpub.com. 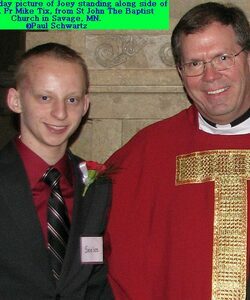 Joey Schwartz,15, from Savage,Minnesota was confirmed Saturday 12th February at 1000hrs in the Catherdral in St Paul,which is the National Shrine of the Apostle Paul.Joey was diagnosed with a rare form of cancer in March 2008.He is now totally free of the cancer and he and his family belive firmly that it was through the prayers and intercessions they made to Blessed Seelos that this came about.Last Saturday he and his twin brother Derek were amongst those young people in the Diocese who were to become "Soldiers of Christ" through the Sacrament of Confirmation.Joey chose the Name Seelos for his Confirmation name..His Father Paul told us "Joey has a very special affinity with Blessed Father Seelos. 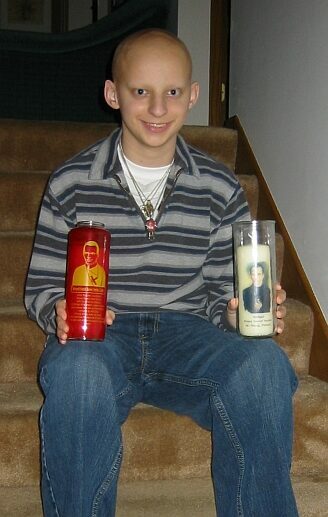 He has established himself as Joey's guide and protector, and helped to provide him with the continued gift of life through his powerful intercession. 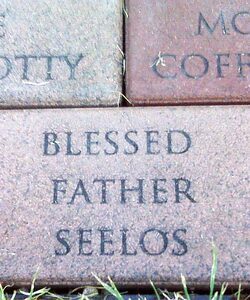 It was a natural choice for Joey to take the confirmation name Seelos in his honor. 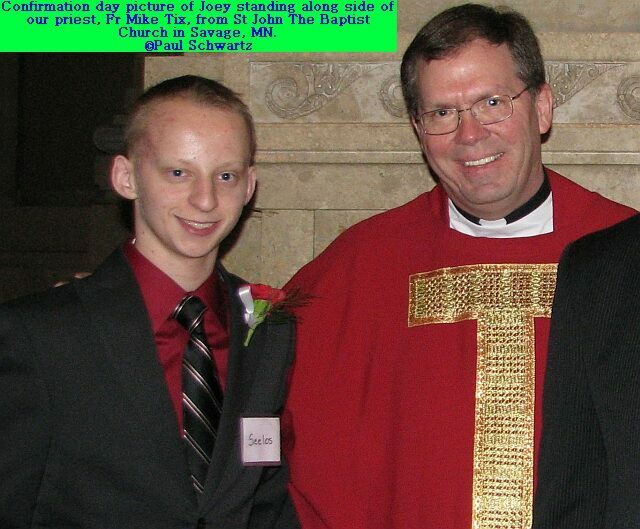 "We ask your prayers for Joey and all those who were confirmed into the Catholic Faith with him. 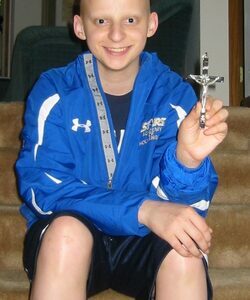 A recent picture of Joey holding the Seelos Cross which was sent to the family by the Shrine last year. It had been blessed by Father Byron Miller,Excecutive Director of Seelos Shrine,it was also touched to various relics of Father Seelos. Every parent dreads to hear that one of their children is suffering from cancer.Paul Schwartz knows better than many how it feels.On March 10 2008 his son,Joey enterred hospital for a minor surgical procedue to remove a lump.Little did the family know this was going to be a turning point in their lives.Joey was diagnosed with a very rare cancer called Midline Carcinoma. Since then people worldwide have read about the story of Joey's alleged healing due to the intercession of Blessed Francis Xavier Seelos. But what is it like to be the parent who has to make the decisions about your child's treatment?Why did the family decide to continue on with treatment when it was claimed Joey had been healed by Blessed Seelos's intercesion? Joey's father Paul has allowed us an in-site into how the family felt and came to its decisions during this tumultuous time after the alleged healing following a visit to the National Seelos Shrine in New Orleans.We hope it will help others in the same position to know that they are not alone and that through prayer God strengthens us to trust in Him more. 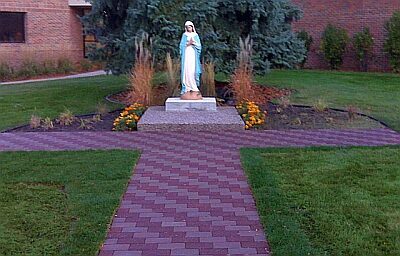 "I wanted to pass on a quick story related to Joey, and the intercession of Blessed Father Seelos and our Lord Jesus Christ's recent response to our prayers . 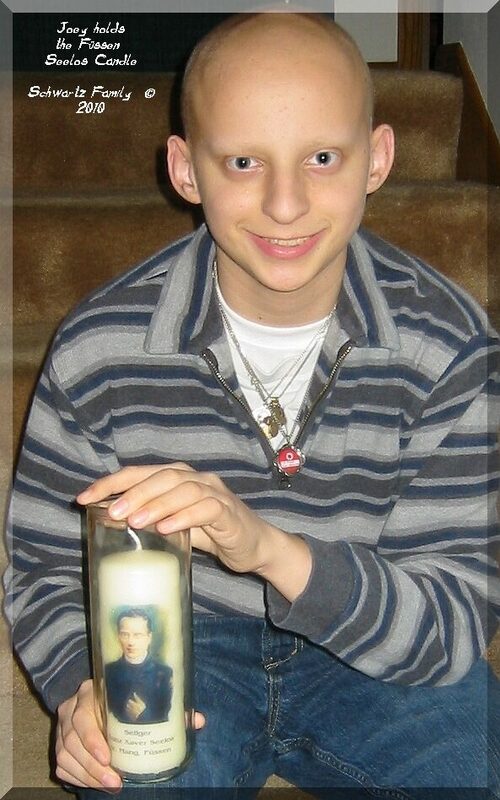 . .
As we discussed before, we believe that Joey was cured through the intercession of Blessed Father Seelos and the power of our Lord Jesus Christ, during our visit to the Seelos Shrine on August 2, 2009. It's been a difficult journey for us to continue Joey on chemo treatments, poisoning his body with toxic chemicals, knowing that he was already cured. However, understanding that God operates in some mysterious ways, we knew He could possibly be performing Joey's miracle through our doctor's hands, so we continued with treatments. Over the past year, through intercessory and direct prayer, we have been asking God to guide Joey's treatment. Our faith was really put to the test starting this past December. At that time, we began having discussions about the end point of Joey's treatments with our medical team. Our doctor was telling us that Joey might require a minimum of 1 to 2 more years of chemo, possibly even having to be on some form of treatment for the rest of his life. We were very conflicted between faith and logic. We knew God had already cured Joey, but we also knew that he had a highly lethal cancer that had to be treated very aggressively. If God had already cured Joey, but if He was working through the medical team, why were we being told Joey needed 2 more years of treatment? I can tell you, we were not very comfortable with this decision. We increased the frequency and intensity of our prayers. 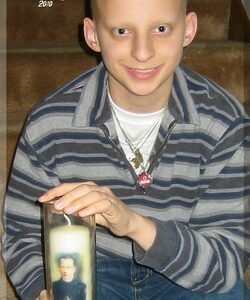 We asked Blessed Father Seelos to continue to intercede on Joey's behalf. We asked God to, now more than ever, guide medical team on the most appropriate treatment path. On April 17, our prayers were answered (yet again). When we came to the clinic appointment, our doctor surprised us by saying he had reconsidered the plan and proposed to end treatment after 2 more cycles of chemo. As adamant as our doctor was only a few week earlier regarding the extended treatment, it could be only by God's direction and influence that he had changed his mind. On May 28th, we experienced further the effects of God's influence when our doctor came into the exam room and asked if Joey was comfortable in ending treatment now and foregoing his final scheduled cycle of chemo in 2 weeks. Prayer is definitely a very power tool ! So, as of May 28th, we have totally and completely placed Joey's cure in God's hand. We are comfortable with that as our faith is strong, and only get's stronger as we continue to bear witness to His love and mercy. We will also be eternally grateful for the intercession of Blessed Father Seelos for bringing Joey's cause to His attention and securing His mercy and blessings." Joey Schwartz whose story has been broadcast worldwide after battling cancer and his alleged healing due to the intecession of Blessed Francis Xavier Seelos was admited to hospital last week.Joey was suffering from a chest infection which made his counts sink very low.Thanks to intecesary prayer he is now back out of hospital and on the mend..
St John The Baptist Catholic Church in Savage, MN is in the process of creating a memorial garden dedicated to the Blessed Virgin Mary. 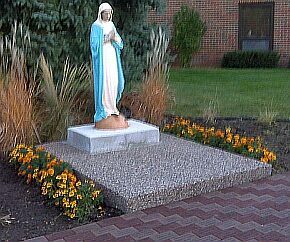 The Parish have decided to use an existing statue of Our Lady as the centerpiece,It origionally came from the Church that stood there in 1902.The garden has a contemplative prayer area and beautiful landscaping. 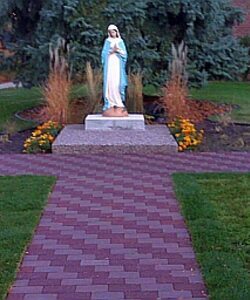 One of the ideas they have integrated into the garden is for small paving stones or "pavers" which can be brought for $100.Each paver can be inscribed with the name of someone living or dead. 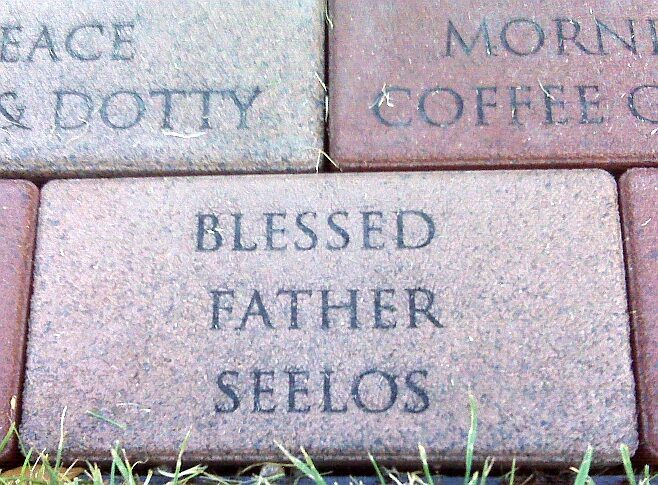 The Schwartz family in the Parish who have a lot to thank Blesed Seelos for,they claim that their 15 year old,Joey,was healed of cancer through the intercession of Blessed Seelos.It was therefore no surprise that as Parishioners they wanted to say thank you to Blessed Seelos have one of the pavers inscribed with "BLESSED FATHER SEELOS"
3 years after suffering from a very rare cancer,Joey Schwartz is to return to the Seelos Shrine this Thursday,2nd August 2012,exactly 3 years to the day his family believe Blessed Seelos interceded for him and he was healed. 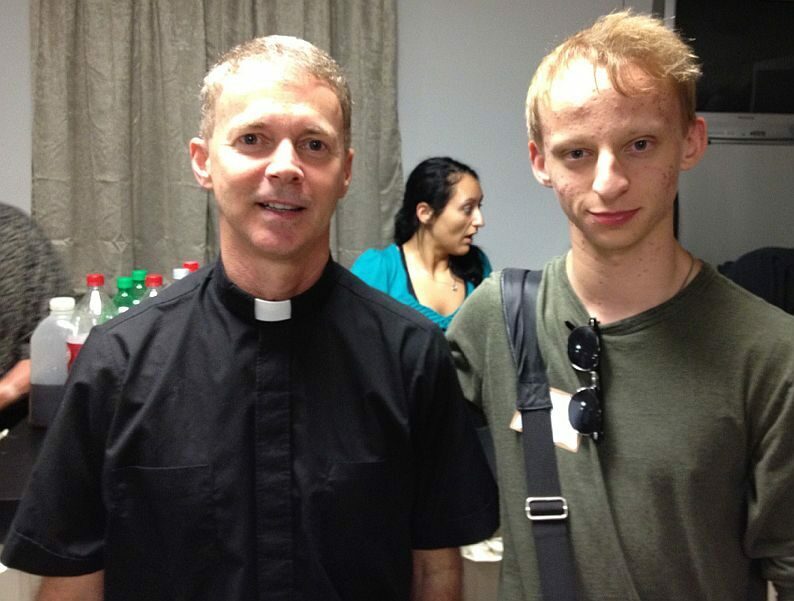 Joey with Father Byron Miller C.Ss.R. His Father Paul told us "In March of 2008, my then 13 year old son Joey was diagnosed with a very rare and highly lethal cancer called Midline Carcinoma. The average survival time for this cancer is 6 months and there is no proven treatment. At the time of his diagnosis, he was the 14th reported case and there was only one "rumored" survivor.Following the surgical removal of a fist sized tumor from his chest wall, and over a year of highly aggressive chemotherapy and radiation treatments, there was no longer any sign of the disease. We believed Joey had been cured.Unfortunately, during a follow up PET Scan in July of 2009, we were given the news that Joey's cancer had returned. There were now dozens of tumors throughout Joey's lungs and another large tumor on his chest wall. The doctor looked us in the eye and told us he "couldn't offer us any hope" but could try some other chemotherapy agents to extend Joey's life.Following the devastating news, a friend of the family told us about Blessed Father Seelos, a Redemptorist Priest from the 1860s, who was being considered for Sainthood. 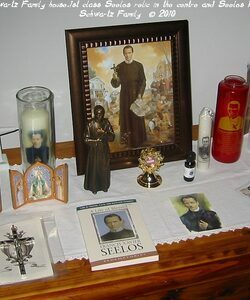 A few weeks later we headed to New Orleans to visit the Seelos Shrine. A month following our visit to the Shrine, Joey had a followup CT Scan. The scan revealed no detecable signs of disease; all the tumors were gone from Joey's lungs and chest. Joey remains cancer free to this day, and the positive outcome of his illness continues to mystify his medical team"
The family are in New Orleans,today St Mary's Assumption Parish had a Christmas in July Lunch at the Seelos Knights of Columbus Hall. Father Byron Miller C.Ss.R. thanked Joyce Bourgeois for the time and effort she has put in over the years as the Seelos Center Administrator. Joyce Bourgeois,Administrator of the National Seelos Center,New Orleans being thanked By Father Byron Miller C.Ss.R. 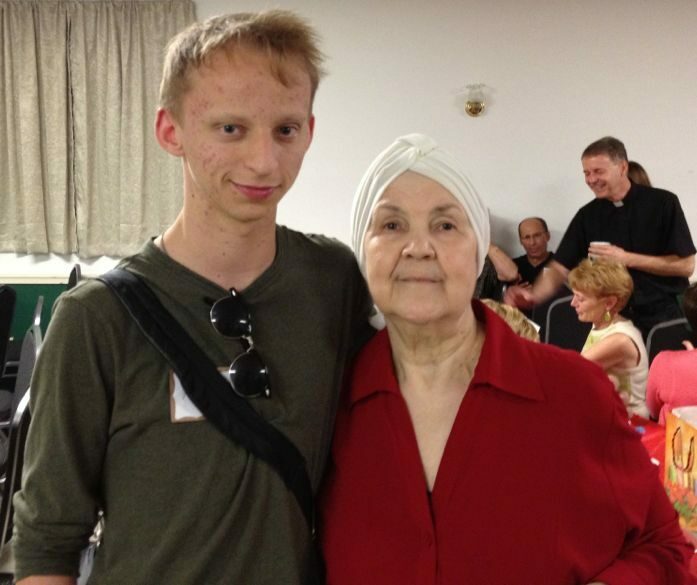 Joyce has been suffering from cancer herself and still has 8 months of chemotherapy ahead of her.Joyce who has helped and encouraged many thousands of pilgrims to the Seelos Shrine over the years told Joey "that God has a purpose for him. 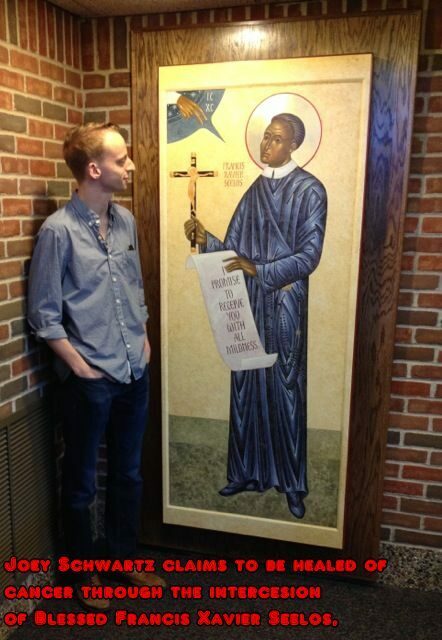 He needs to be a guiding light for young people to believe in and support the Catholic faith." 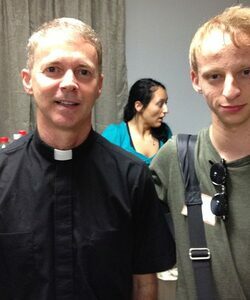 Father Byron also told those gathered that " another miracle submission was recently turned down . . . a lady who was unable to walk, but regained her mobility after visiting the Shrine." Joey's father Paul told us " Joey has been designated as a fallback miracle submission of sorts (if they can't get another one approved sooner). The Vatican is now requiring 10 years on cancer cases. Joey has 7 more years left on the clock." If Joey was eventually to be chosen the 7 years would bring us to 2019,which just happens to be the 200th Anniversary of the birth of Blessed Francis Xavier Seelos on 11th January 1819.